In this section, auxiliary and complementary code is presented that may prove useful in various rough surface scattering simulations. The code includes algorithms for calculating and plotting amplitude and intensity reflection coefficients of various media , methods for converting between optical and dielectric constants and routines for computing distributions of surface normals och inclination angles (the angle between the local surface normal and a reference axis, usually the global surface normal). DESCRIPTION: calculates the amplitude reflection coefficients rs and rp of light incident from air with a polar angle of incidence theta on an optical medium with complex refractive index n+ik using Fresnel's equations. DESCRIPTION: calculates the intensity reflection coefficients for s- and p-polarized components and circular polarized (or unpolarized) reflectivity for light incident from a perfect dielectric medium (medium 1) with complex refractive index n1+ik1 to an absorbing medium (medium 2) with complex refractive index n2+ik2 with angle of incidence theta (given in radians) using Fresnel's equations. DESCRIPTION: plots the reflection and/or absorption coefficients (s-pol, p-pol and circ.) for light incident from a dielectric medium (medium 1) with refractive index n1 on an opaque absorbing medium (medium 2) with complex refractive index n2+ik2 using Fresnel's equations. 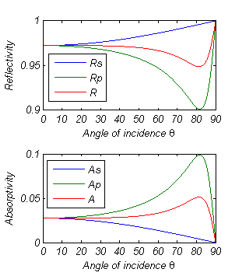 Figure 1: MATLAB plots of the reflectivities and absorptivities as a function of angle of incidence using fresnelplot (in this particular case for copper at a wavelength of 1.06mm). DESCRIPTION: converts the complex refractive index n+ik to the complex dielectric constant e1+ie2. DESCRIPTION: converts the complex dielectric constant e1+ie2 to the complex refractive index n+ik. DESCRIPTION: estimates local surface normals of a 1D surface profile y=f(x) using central differences of a 3-point neighbourhood with the reciprocal of the squared Euclidean distance as a weighting factor. DESCRIPTION: estimates local surface normals of a 2D surface z=f(x,y) using central differences of a 3-point neighbourhood with the reciprocal of the squared Euclidean distance as a weighting factor. DESCRIPTION: plots the distribution of the inclination angles of a 1D rough surface profile z=f(x). DESCRIPTION: plots the distribution of the inclination angles of a 2D rough surface z=f(x,y). Figure 2: MATLAB plots of the inclination angle distributions for 1D surface profiles using iaplot1D (left) and for 2D surfaces using iaplot2D (right), both surfaces with the same rms height and correlation length illustrating the difference in 2D and 3D scattering. Modest, M.: "Radiative Heat Transfer", Elsevier Science, 2nd Edition (2003). This page was last updated on February 26, 2012 14:04 .